Have you ever asked a friend for their delicious roasted chicken recipe, and when you make it, somehow it doesn’t taste the same as their recipe? Have you wondered if they left out part of the instruction or even maybe an ingredient? Some people are really possessive about their recipes, and I can understand that. Any really delicious recipe has a secret. Roast chicken done right is juicy and full of flavor. Done wrong, it’s flavorless and dried out and needs tons of gravy to compensate. Unfortunately, we more often than not, defer to store-bought, ready-made, hot roasted chicken. So convenient, but not nearly as tasty as home-made. Have you forgotten how real roast chicken is supposed to taste like? Want the secret to juicy roast chicken? 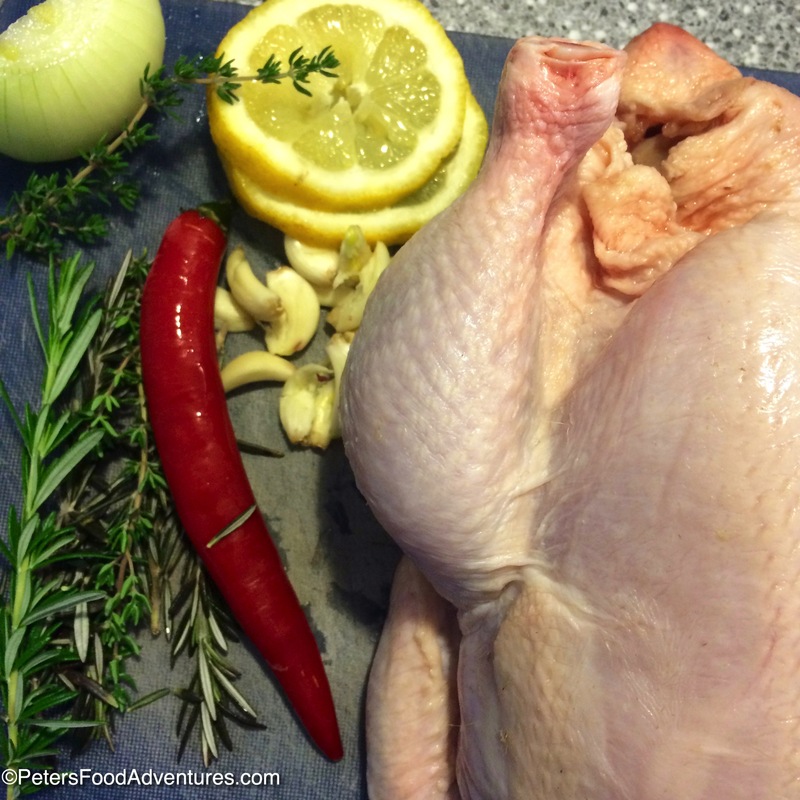 It’s really simple to rub and stuff the chicken with fresh herbs and garlic and lemon. Just remember to microwave the lemon before you put it inside the chicken, for about 30 seconds. As the inside of the chicken is the coldest, and takes the longest to cook. By microwaving the lemon, you ensure the chicken reaches the correct internal temperature. I also never put a whole unsliced lemon inside the chicken cavity, while it looks pretty, it doesn’t add enough flavor to your meat. I also add half an onion for extra flavor. You can eat the onion and garlic with your meal. The cooking time is dependent on the size of your chicken. As a guide, chicken cooks at approx 25 minutes per 500g/1lb of weight at this temperature. When the chicken is cooked and the juices run clear and the meat easily separates from the bone. So these are great tips, but is that the secret to juicy roasted chicken? Here it is… Make sure you place the chicken breast facing down on the roasting pan. This will make sure the chicken remains juicy and full of flavor, as the juices flow down to the breast while it cooks. It will look like your chicken is upside down, and I suppose it is. All these things together make the secret to making Juicy Roasted Chicken with lemon. So now you have the secret to juicy, flavorful chicken you can choose to share…..or not. Bon Appetit! Приятного аппетита! Rub chicken with rosemary salt/pepper then drizzle with olive oil and rub all over. If you don't have rosemary salt, then crush some dried rosemary with salt in a pestle and mortar. The large rosemary leaves tend to fall off easily, so crushing them is a better solution to release flavour. 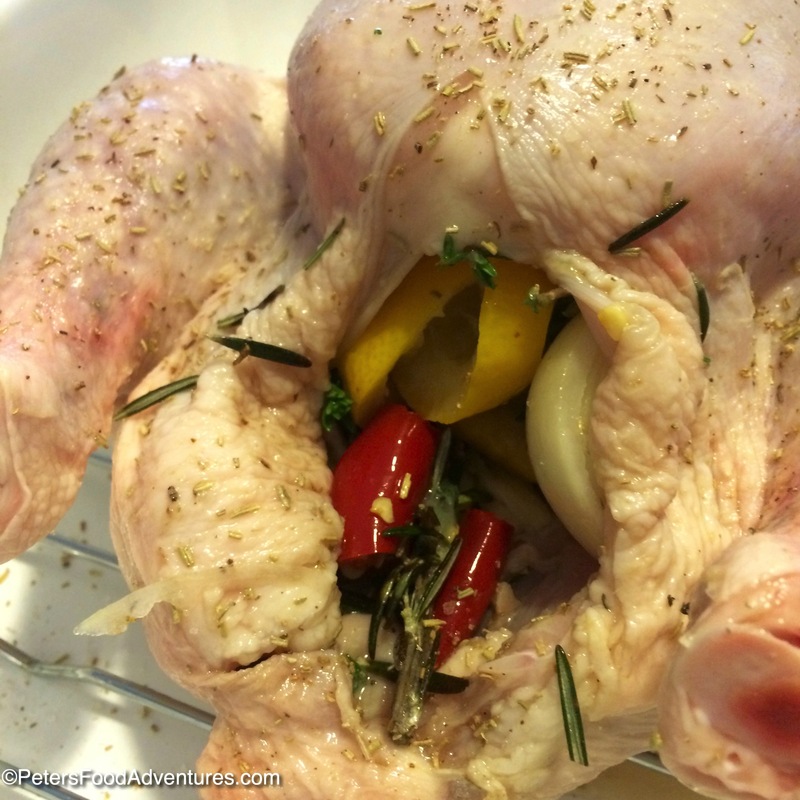 Insert hot lemon, rosemary, thyme, onion, garlic, and chili inside the chicken cavity. Place chicken (breasts facing down) on a roasting pan with a wire rack into the oven. Add 1/2 cup of water to the bottom of the pan and put in the oven. Keep in oven for approx 30 minutes until it crisps up and is lightly golden. Cover with foil for remaining cooking period. Baste the chicken several times if possible. Remove foil for last 10 minutes of cooking to crisp skin to a golden brown. Chicken cooks at approx 25 minutes per 500g/1lb of weight at this temperature. When the chicken is cooked and the juices run clean and the meat easily separates from the bone, Cover with foil again to allow to rest of 10 minutes. Enjoy! Great flavours used in the chicken ???? Thank you! It was so delicious! ???? Thanks Lynn, Me too! I’m so blessed to be living in a place that grows Rosemary year round!!!! ???? Lemon-rosemary-garlic-olive oil is my all time go-to seasoning for chicken and/or potatoes. Looks great! I’ve never looked back since buying a thermometer to check my chicken is cooked through. Gives me the confidence to cook it for less time than suggested.